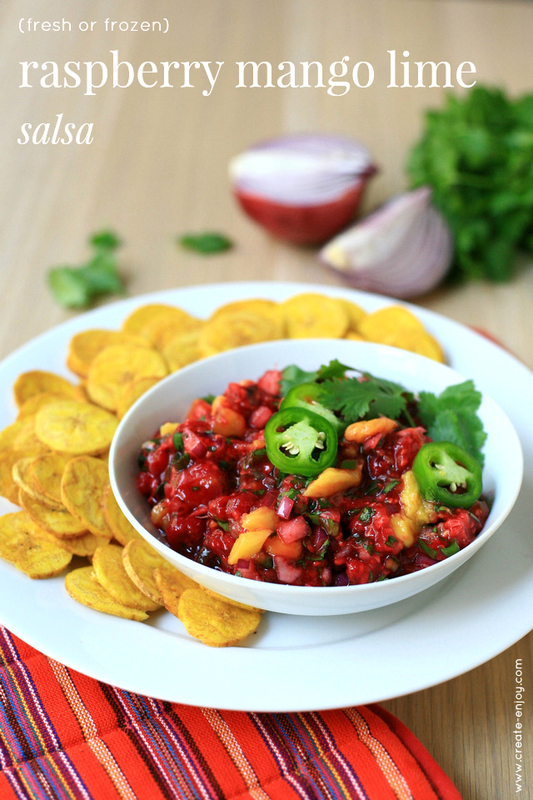 Raspberry mango lime salsa - from fresh or frozen berries! I got really creative with this recipe and - spoiler - it totally paid off!! I took on the challenge of a non-dessert appetizer recipe and made this tangy, spicy salsa. I wasn't quire sure what it would be like but I used fresh salsa essentials (lime, cilantro, etc.) and it ended up being so tasty and perfect with plantain chips (one of my favorite foods of all time)! Would be an excellent springy or summery party appetizer! Serve some guacamole or avocados on the side, too, or try it on top of a protein like chicken, pork, or maybe even fish. I love berries so much and while I love picking them myself and eating them right away, I also love freezing them and having them on-hand later on. I'm out of raspberries we picked last summer so I bought these at a local natural grocery store - look for some near you! More than 90% of the berries we grow in Oregon are flash frozen within hours of being picked at the peak of ripeness, locking in maximum nutrition, taste, and color. Combine all ingredients except mango in a mixing bowl. Stir so raspberries begin to break apart. Add mango chunks last, stirring gently but not too much so the bright orange color is still apparent. Enjoy!! Serve with plantain or corn chips, or with fish?, chicken, or pork! Husband was very skeptical of this flavor combination but this recipe really won him over! A success! Thanks to the Oregon Raspberry and Blackberry Commission for sponsoring this post by providing me a gift card for shopping for these ingredients!